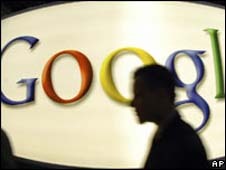 Internet search engine Google has become the UK's top brand for the first time, according to a consumer survey. It moved up two places from last year's poll, beating Microsoft into second place and Mercedes Benz into third. Google also topped a poll of "superbrands" as judged by professionals earlier this year. No supermarkets made it into the top 100 superbrands in the survey of 2,200 consumers. It is thought confidence may have been hit by rising food costs. Among leading supermarkets, Asda dropped 253 places, Tesco 230 and Sainsbury's 194 places compared to the 2007 survey. But premium food brands performed better and Marks & Spencer was voted into the top 20. Stephen Cheliotis, chairman of the Superbrands Council which commissioned the research, said: "Lifestyle brands, particularly those in the technology sector, have considerably more sway with the public than everyday staples such as the supermarkets, which now seem further than ever from the affections of the British people. "As the spectre of rising food costs continues, they are likely to come under further scrutiny. "The results are also a further sign that Google is continuing its dominance in the UK. It is clear that Google is the brand that people value at work and in their personal lives." Members compiled a list of more than 1,000 brands according to quality, reliability and distinctiveness and this was then passed on for consumers to rate.